I often follow several publications related to trends and emerging innovations in retail and consumer goods. Artificial Intelligence (AI) continues to be touted as a key ingredient in transforming this industry. I agree with this sentiment given the critical components of cloud computing and data availability, which combined create a case for modernization. We are seeing real application of AI resulting in positive business improvements aimed at solving a range of service to production-type problems. These examples are tangible and exemplify the merits of AI and its applicability in retail and consumer goods. Take Macy’s virtual agent that can solve customer issues via the web and transfer customers seamlessly to a live agent if necessary. More than one-quarter of customer queries are answered by a virtual agent, improving the speed of service for customers and providing valuable data that is connected to back-end systems through Microsoft Dynamics 365 AI solution for customer service. Deschutes Brewery is another great example. It’s the seventh-largest craft brewery in the United States. By partnering with OSIsoft PI System to collect and manage production data with Microsoft Cortana Intelligence Suite, they have estimated a 20 percent increase in production capacity leveraging existing equipment by implementing predictive analytics to optimize production. 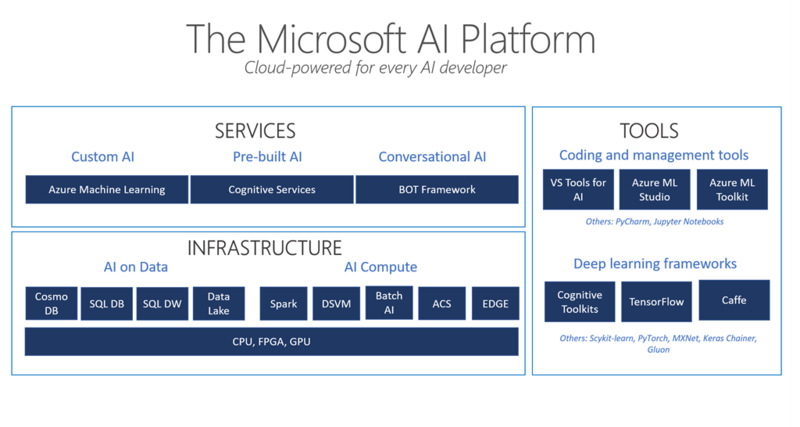 The AI platform offers flexibility for those who may want to use pre-built AI APIs or develop custom models with your data using the infrastructure and tools available in the platform. To determine the best path forward, it is important you have an understanding of each approach which is highlighted below. In short, pre-built AI may offer desired functionality and save you time from having to perform model creation; therefore accelerating delivery efforts. Pre-built AI APIs. Leverage models that are built and trained for about 80 percent general use cases, such as Speech API that converts text to speech. These APIs are exposed as web services. In cases where you have very specialized scenarios or heavy domain language, you may opt for custom models to meet the unique needs of your scenario. Pre-trained models. There are some pre-trained prediction models available, where the AI application needs to load the model and invoke their predictive capability. In the AI platform, you must determine where you build your model and how you make it available to your applications. Build on-premises. Some models depending upon size can live on-premise in your datacenter or another storage mechanism. Build a model in the cloud. For data accessibility, building your model in the cloud offers scalability for both data storage and processing power. Make available REST services, where you deploy the model as accessible REST service. Use custom model directly in the context of the AI application, loading the model from a file to the AI application when you want to apply the predictive capability. Use in the context of an SQL database, where your trained model is stored within the table of the relational database, and it is accessed by executing a SQL stored procedure. 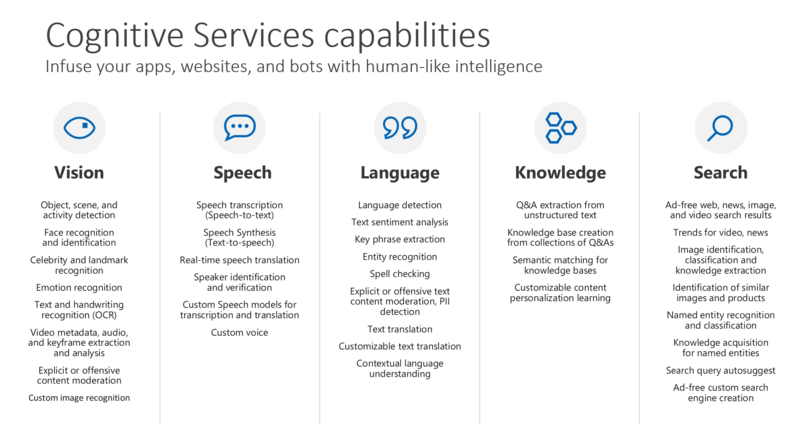 To make the Microsoft AI platform real, read the Inventory Optimization -SKU Assortment use case for retail and consumer goods. It provides a use case for advanced analytics discussing the concepts mentioned in this blog.